or as provided in collective agreement. Details related to any changes to bus routes will be communicated to students and parents/guardians through the school and/or direct contact with parents/guardians. It is expected that several days may be required for students and bus drivers to become fully accustomed to their routes. Your patience and cooperation is appreciated. Students, parents/guardians, motorists, the school bus driver, teachers and Transportation Department staff share the responsibility for school bus safety. Please slow down in school zones, pay extra attention to children walking to and from school and never pass a school bus when its red lights are flashing. The speed limit in school zones is 30 km/h in areas where the approaching limit is 50 km/h, when children are present. In school areas where the surrounding speed zone is higher, the speed limit is 50 km/h when children are present. For more information on bus safety, please access the brochure entitled, School Bus Safety: A Guide for Students and Parents/Guardians available in the Document Depot section of the Regional Centre’s website at www.srce.ca. For more information on School Zone Safety, please visit the Nova Scotia Department of Transportation and Infrastructure Renewal website at https://novascotia.ca/tran/. By working together, we will ensure the bus trip is a safe one. As part of its safety program, the Province of Nova Scotia introduced integrated booster seats in all newly purchased school busses. These seats will be used for those students who weigh less than 40 pounds and who will most benefit from this enhancement to school busses. As a result, during the first week of school, Grades Primary and One students traveling on busses equipped with an integrated booster seat will be assessed to determine if they will be assigned to a booster seat. If your child meets the criteria, parents/guardians will be notified following the assessment. The Strait Regional Centre for Education will not alter or extend bus routes for the purpose of transporting students to after-school programs offered by Day Care Facilities. 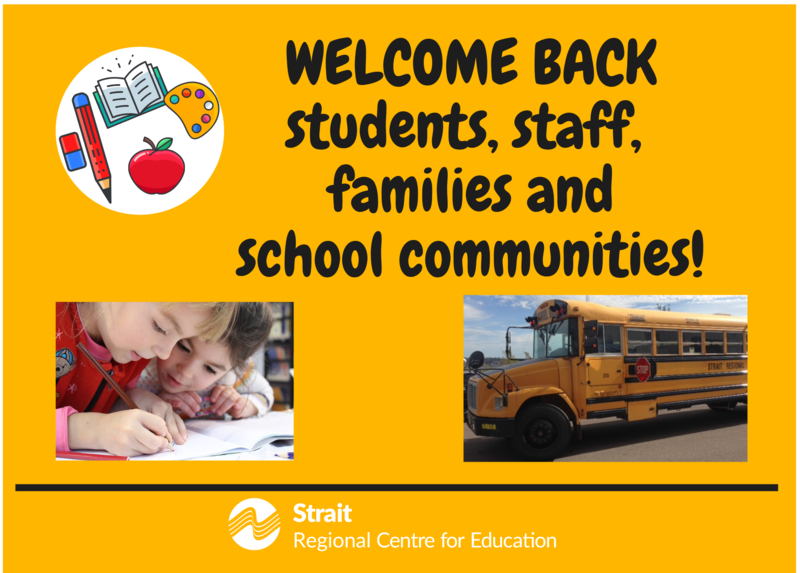 The Strait Regional Centre for Education is pleased to announce the opening schedule for the Pre-Primary Programs at all fourteen (14) school locations. An orientation session for children and parents/guardians will be held on Friday, August 31, 2018, 9:30 a.m. to 11:30 a.m. Families will visit the school with their child, meet staff and receive program information. The first day for children is Tuesday, September 4, 2018. Families will be contacted during the week of August 27-30, 2018, to confirm details regarding the orientation at their respective school. Program hours will vary depending on individual school schedules. The Program will run from September 2018 to June 2019. For more information on the Pre-Primary Program or to register your child, parents/guardians may contact Carolyn Webber, Manager of Pre-Primary and Early Years Programs at carolyn.webber@srce.ca / 902-631-4617, and access www.srce.ca. For more background information, please visit https://www.ednet.ns.ca/pre-primary.